"We have big plans for you, Peter Parker." That quote, featured in the latest trailers for Marc Webb’s The Amazing Spider-Man 2, is attributed to Norman Osborn (Chris Cooper), though it also is being shared by executives at Sony as they map out the future for Parker, Spider-Man and the lucrative superhero franchise. Beginning with Webb’s next movie, the studio plans to make at least two more sequels, with talks of spinoff films being floated on a daily basis. Sony’s plan is to have a new Amazing Spider-Man movie in theaters every year… a model being mapped out by Disney for its Star Wars franchise, as well. 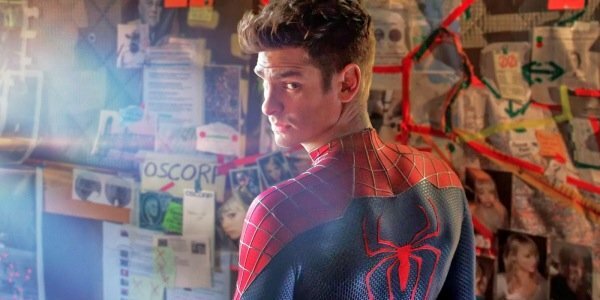 Webb has told us in exclusive interviews that Peter Parker (Andrew Garfield) has grown confident – and probably a little cocky – in the Spider-Man suit by the time Amazing Spider-Man 2 starts. The origin story is behind us, thanks to the 2012 franchise reboot, and Peter has matured into a hero who now protects the city of Manhattan. You almost get the sense that, with the origin story over, the franchise can finally get started. Which is why the tagline on the posters promises, "His greatest battle begins." But who will he fight? 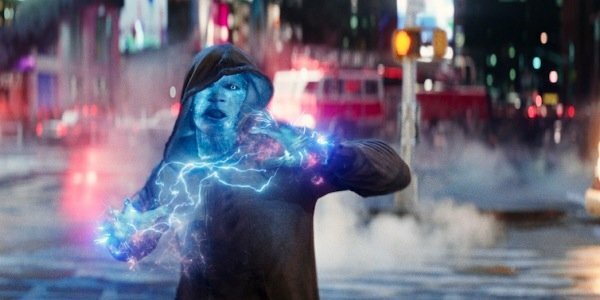 Sony has been teasing a bevy of potential villains (with the promise of a possible Sinister Six movie in the future), but the mains villain in Amazing Spider-Man 2 – according to Webb – has always been Electro (Jamie Foxx). At the start, Max Dillon will be a mild-mannered, nearly-invisible OsCorp employee who has an odd fascination with Spider-Man. But a tragic lab accident plunges Max into a vat of electric eels, giving him the power to control electricity. Recent trailers hint at a major battle in New York’s touristy Times Square, while the film might conclude at a massive OsCorp power plant … from what we have been hearing. Knowing that he has to start planting the seeds for a Sinister Six movie, Webb will introduce supporting villains played by major actors in Amazing Spider-Man 2. So we get scenes of Paul Giamatti as Russian gangster Sytsevich, who will be an early thorn in Peter’s side. I’m guessing that – after a destructive car chase through New York City – Aleksei will be incarcerated, where OsCorp will get its hands on the maniac, turning him into the Rhino. There are shots of Giamatti in a pre-production "suit," and quick snippets of a metallic Rhino in the trailers. How much Rhino we get in Spidey 2 is an open question. But you don’t cast Giamatti for a cameo. Chris Cooper has been cast as Harry’s father, Norman. And like I said with Giamatti, you don’t cast Cooper for a cameo. In the very quick snippets of footage we have seen of Norman in the trailers, he’s sick. As was mentioned in the initial film, he’s dying… and part of the research started by Dr. Curt Connors (Rhys Ifans) was to deliver Norman a cure. Instead, it likely will push him to become a Goblin, as well. But will he hate Spider-Man because of something tragic that happens to his son in Amazing Spider-Man 2? Or will be fight alongside Harry in future films? Norman remains the biggest mystery of the still-developing Spider-Man saga at Sony, and I think once his role is revealed, several more major pieces will fall into place. The other big question is, "Will Gwen be here to see these pieces fall into place?" And I’m fairly confident the answer is no. Sorry, Emma Stone! Spider-Man readers know what happens when you mix Gwen and the Goblin in the same story. Peter’s love interest (usually) has to die. Unless you are Sam Raimi, and you drastically rewrite history. Webb likely will not let Gwen survive. This major plot point was hinted at near the end of the first Spider-Man movie, with Denis Leary’s Captain Stacy telling Peter to leave his daughter out of his heroic escapades, because her life would be in danger. The latest Amazing Spider-Man 2 trailers tip their hat to Gwen falling, but Peter catching her. Gwen then is shown staring back at her boyfriend… instead of having her neck snap from the "thwip." Studio deception? Stone being preserved for future sequels? We’ll find out soon enough. Loss colors Peter Parker’s existence. He lost his Uncle Ben. He might lose his girlfriend. And as a young child, he lost his parents – Richard and Mary Parker – and that mystery has to be explored deeper in Spider-Man 2. 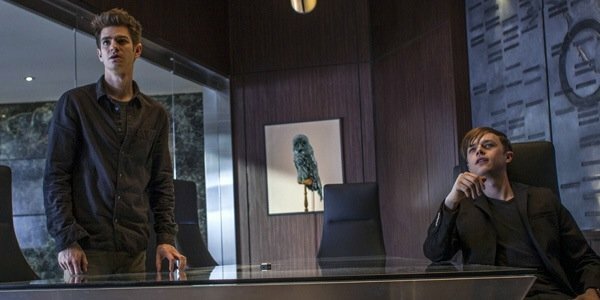 It has been made clear that Richard (Campbell Scott) worked at OsCorp, and that his research might have led to the experiments that gave his son his unique power. From what we can tell, Peter is going to find a hidden lab that might clue him in that what his father was working on. But we need a LOT more details about how the Parkers died, and what Peter’s dad might have been deducing before he had to run off like a thief in the night. Webb isn’t running off. 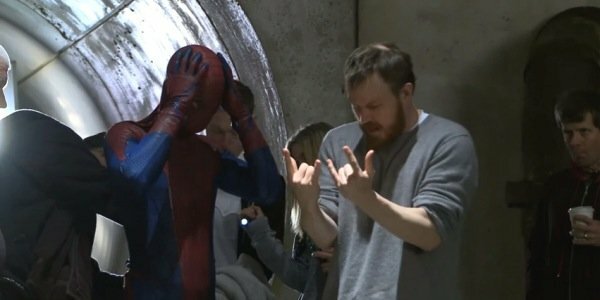 Having put the finishing touches on his second Spider-Man movie, the director recently confirmed that he’ll be back for Part Three, bringing conclusion to a storyline that he tells me he always envisioned as a trilogy. Beyond that? It’s anyone’s guess, though I’d be willing to bet that after three, Webb will move on to other projects, and fresh voices will be brought in to explore Spider-Man stories through a Sony brain trust. Drew Goddard, for instance, has been tapped to write that Sinister Six movie. And Spider-Man 2 co-writer Alex Kurtzman would like a crack at Venom. Are we almost at Six? Possibly, depending on who sticks around. The Lizard remains in play, as Ifans’ character didn’t die. Add a Rhino, Goblin and Electro to the mix, and we’re at four villains. Venom’s a possibility. Cooper could play a second villain. And then, there’s the image above, screen-grabbed from an earlier trailer that shows the mysterious mid-credits character walking through OsCorp. He passes Doctor Octopus’ arms, and a clear set of mechanical Vulture wings. That’s more than a tease. It’s a promise. For part 3? Beyond? Perhaps. Stay tuned, true believers!